It is helpful when setting up a Session Initiation Protocol (SIP) trunk group in the Avaya Aura Communication Manager to know what the SIP Trunk Protocol Variations mean. Enables or disables the encoding of URIs in call control signaling messages originated at the gateway with the “user=phone” parameter. No subscription messages are encoded with the “user=phone” parameter, even when the field is set to y. Default is n.
If you set this field to y, when a call is routed over a trunk group, Avaya Communication Manager inserts a leading plus (+) sign, if absent, in outgoing calling, alerting, diverting, or connected numbers. The default value is n.
To prevent Communication Manager from inserting a leading plus (+) sign in the calling number when a call is routed from Communication Manager to Avaya Session Manager, set the Numbering Format field to private and the Prepend '+' to Calling/Alerting/Diverting/Connected Number field to n.
Enables or disables sending the transferring party information on a transferred call. Default is disabled. If enabled, Network Call Redirection (NCR) service is signaled over this trunk group. NCR only works on trunk groups connected to Service Providers that support NCR. This field is available only when the Service Type field is set to public-ntwrk. If you enable the Send Diversion Header field, the SIP diversion header is sent on the public SIP trunks. This header allows service providers to use the ten digit number of the forwarding party for functions such as billing. Customers can administratively enable or disable use of the SIP diversion header on any public SIP trunk. The default value is n.
You can activate the Support Request History field for an Off PBX Station (OPS) SIP endpoint to capture the location of the request that was sent to a proxy. This information will be used to send diversion information and to notify of the origin of the call to a calling off pbx station SIP Endpoint. If this field is disabled, History-Info header will not be included in any requests. Valid entries are 96 to 127. This defines the default payload type offered by CM for SIP trunks. The payload type number encoding for originating (offering) the RFC 2833 (updated into RFC 4733) “telephone-event” payload format is based on the administered number from this field. This value is used only for Communication Manager originations (outgoing offers). Default value is 127. Used for early media and direct media cut-through. When SDP answer is returned by Communication Manager in 18x messages, some entities have a problem receiving the SDP in a 180 Ringing message. If you set the Convert 180 to 183 for Early Media field to y, Communication Manager puts the SDP into a 183 Session Progress message. The default value is n.
If field is set to y, CM sends the re-invite message to display update. If field is set to n, CM sends the update message to display update. The default value is n.
This field determines which header to retrieve display information for the calling party when both the From and P-Asserted-Identity headers are available. Valid entries are P-Asserted-Identity and From. When P-Asserted-Identity is used and a call is terminated at SIP, H.323, or DCP stations, or at outgoing H.323 or SIP trunk, CM displays the name and Calling Party number from the PAI header instead of the From header. When From is used and a call is terminated at SIP, H.323, or DCP stations, or at outgoing H.323 or SIP trunk, CM displays the name and Calling Party number from the FROM header instead of the PAI header. P-Asserted-Identity is default. Based on the value of this field, Communication Manager selects the IP address that must be included in the Via header in an outgoing call. CM will not send the IP address of the caller in the Invite when this field is set to y. If the field is set to n the IP address of the SIP or H.323 endpoint will be sent. In cases where calls are made from TDM endpoints, the IP address of the media processor or media gateway will be sent. The default value is n.
If this field is set to y or n and the user destination in the Refer-To domain of the SIP request is present, CM places the call to the user destination. 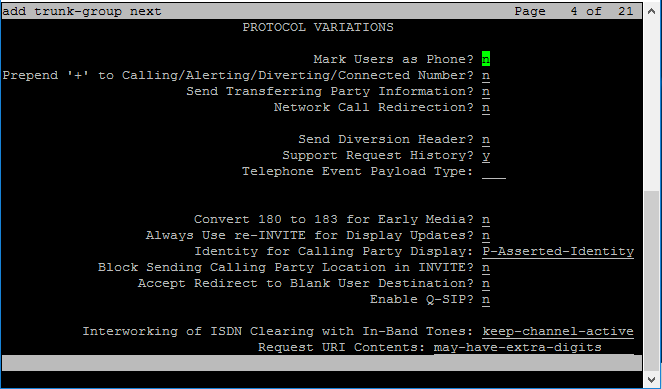 However, if the user destination in the Refer-To domain of the SIP request is not present, CM will place the call over the signal group configured as the Proxy Sel Rte Pat in the Locations screen when the field is set to y and reject the call if the field is set to n.
This field enables QSIG over SIP. If members are assigned, this field should not be changed. If a change is attempted while members are assigned, the system will display an error message prompting the removal of members. The default value is n.
The setting of this field is for call-clearing of the tandem calls in which the incoming trunk to Communication Manager is a SIP trunk and the outgoing trunk from Communication Manager is an ISDN trunk. The far end at the ISDN PRI trunk ends the call. If you select the keep-channel-active option, Communication Manager keeps the call active so that the caller can hear an in-band tone or announcement played over the ISDN trunk. If you select the drop-with-sip-error option, Communication Manager detects the cause of call clearing, maps ISDN Cause Value to a SIP error response message, and sends the response message to the caller. With the drop-with-sip-error option, an adjunct placing outgoing calls is informed that the call has ended and the user can disconnect the call immediately instead of waiting for the ISDN network to end the call after the tone or announcement is complete.